We all have arguments with the people we love. But that doesn’t mean it’s ok to fight dirty. It’s much better if you fight fair. There’s nothing quite so disorienting as fighting with someone you love. It’s easy to imagine a civil disagreement in the abstract, but actually remaining calm and collected in the heat of the moment is a tall order. Even the best relationships break down under the weight of petty disagreements. No matter if everything else about a partnership is in good shape, communicating poorly during a fight is a recipe for disaster. Navigating conflict is just part of the deal when you decide to link your life with someone else. As obvious as that might sound, it’s an issue that multitudes of people struggle with. 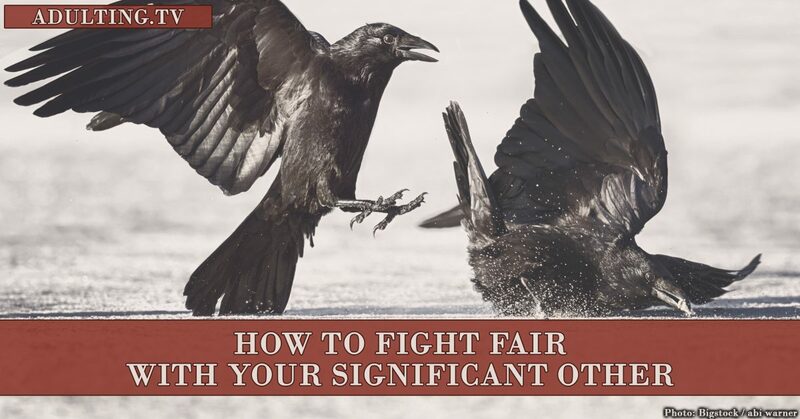 How can you fight fair while still asserting yourself? Getting off track is easy during an argument. Emotions are running high, and it’s easy to start bringing up every single thing your partner has done wrong. Don’t. You shouldn’t pile on during a disagreement. Stick to the discussion at hand no matter how mad you feel, and try to encourage your partner to do the same. Bringing up past issues only derails the conversation and makes it harder to move forward. It also creates an element of distrust, a seed that can destroy even the strongest relationship. If your partner feels you can’t truly forgive them for something they’ve done, how can they trust you going forward? The more you restrain yourself during an argument the less work it will take to mend hurt feelings. It’s never ok to name-call, yell, or throw things at your partner. Part of loving someone is being respectful at all times – especially when you’re fighting. Keep your guilt and shame in check. If the argument is about something you did, don’t let self-pity take over. Negative thoughts only make you feel worse about yourself, which isn’t a productive attitude to have during a fight. The argument or discussion you’re having is a separate incident. It shouldn’t represent you or your partner as a whole. Learn to understand the difference and you’ll feel better when disagreements crop up and be better equipped to fight fair. If you feel emotional, it’s ok to ask for a few minutes to cool down. Write down your thoughts in a journal or take deep breaths can help you decompress, especially if you’re feeling overwhelmed. Taking time to settle down can be the difference between a fight that’s resolved quickly and one that drags on for days. Often, disagreements start because one person makes an unfair assumption about their partner. For example, an old boss of mine told me how every morning his partner left his dresser drawers open. It drove him crazy that his partner couldn’t bother to do something so simple. He mentioned it once in passing, and his partner said he didn’t close them because he was worried the noise from the squeaky drawers would wake him up. It turns out that when he thought his partner was being lazy, he was actually being considerate. Even if you’re sure your partner did something wrong, start the conversation with a non-accusatory tone. You might be pleasantly surprised at the outcome. Plus, your partner will appreciate you giving them the benefit of the doubt instead of assuming the worst. Feeling defensive and ego-driven is normal during an argument, but it can hinder real resolution. Instead of trying to defend your actions, try to understand your partner’s perspective. This is essential if you want to fight fair. For example, if you promised to register the car, forgot, and your partner ended up getting a ticket, imagine what he or she is thinking. They might be wondering if you’re truly dependable, and whether or not they can count on you when it matters. Now imagine you’re on the other end of that argument. Maybe your partner was swamped with work, and registering the car got lost in the shuffle of appointments and assignments. Maybe they misunderstood who was responsible for getting it done. Being more considerate of your partner during a conflict will only lead to a stronger connection and clearer communication. Plus, embracing someone else’s perspective will make you more humble. One of the best ways to resolve an argument quickly is to recognize when you’ve done something wrong – instead of trying to deflect blame and criticism. The quicker you own up to what you did, whether it’s burning the cookies or forgetting to walk the dogs, the better off you’ll be. Fighting fair involves being humble in the face of your mistakes. Consider going to a couple’s therapist if you or your spouse are having trouble understanding or following these guidelines. An objective third party might help you see your communication problems and figure out how to argue more productively. I like the idea of adding for a few minutes to cool down. A lot of stress has been saved by taking a break and getting space.